I haven’t had any luck finding any contact for you but I’d like to feature your blog on Culinate.com. Please drop me a line when you read this. Thanks. I have seen these in the supermarket, but wasn’t sure of them! It turns a gorgeous colour when cooked, doesn’t it? I am with you on the cheese and jam concept! How much did you say you had left? They’re little beauties those quinces, aren’t they? Perfect with cheese. LOVE the stuff. Darn it! You beat me to it. I was going to post a membrillo recipe next week. Alas. I’m glad you did share it though, for membrillo is a wonderful treat and more people need to know about it. I was introduced to it by ECG who grew up eating it in Argentina and Brazil; we found it expensive to buy here, so I figured out how to make it last year and haven’t looked back. I really like it with a hard, nutty cheese like a well-aged parmesan or sheep’s milk cheese. Don’t quinces smell delicious as they ripen? I was just going to pick up some quince paste. Let me tell you, yours looks 10 times better. Great job. I, like you , have always been a bit confused by quinces. I’ve never really dealt with them but know they must be cooked. Quince paste ” pâte de coing” is quite a frequent sweet to make at home in this part of France. OH QUINCES! How I love thee! How bummed I have been that for two years in a row I missed their season over here. I make a killer Quince Relish (also beautiful with a cheese platter) and when you bake them? The colour and smell that fills your home. Sigh sigh sigh. This looks so good, Wendy! I have never had quince, but have had quince paste – but never homemade! Something I’ve always wanted to make but never been gutsy enough to attempt so I’m doubly impressed Wendy! Looks fabulous! Congratulations Wendy, this is not an easy thing to make! People here in Provence spend years learning how to get it right! The homemade stuff tastes so much better than anything you can buy in a supermarket (even in Portugal!). Membrillo is so wonderful to have on hand, and I’m so impressed that your quince fruited its first year! Cheese and jam in any guise is one of my favorite combinations too. Great post! Holler – In all seriousness, it’d survive the post if you’d like some! Will email you. Lucy – Wee gems, indeed. Christina – Will be interested to see if you use the same method. 🙂 Only had that brie in my fridge (not wise to have lots of cheese around me) but will buy some hard cheese soon! Maryann – Thank you! I’ve never tasted it before so can’t really gauge how good it is in comparison to others. Betty C – I know you can casserole them too. Haven’t tried it yet though! Kim – Quince relish, you say? Sound great. Did you blog about it? Rosa – Hmmmm, am now thinking I should go buy some membrillo and compare it with my own. Perhaps it doesn’t taste like it should!!! 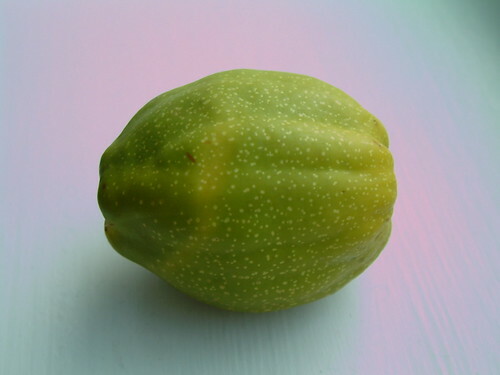 So this is what quince looks like! Thanks Wendy. I love cheese and jam too (cheddar and bramble, mmm). Your quince looks wonderful; if I can find any in the markets this week, I shall be making some too (since having some paste on hand is partially an excuse to bring more cheese into the house). Believe it or not, I’d never seen a whole quince before! There’s this really good cheese store in my hometown in CA that serves quince paste with a variety of cheeses and toast for breakfast. That last picture reminded me of eating it with my mom last year out on the store’s patio. I have never had a quince before. A friend of mine made a sort of chutney out of one, but I did not get to taste it. What is the flavor compared to? Wendy, I am so amazed of all the goodies that your garden has given you this year! You must have a very green thumb! Wendy – in the 1st house I bought 10 years ago I had a little bush in the front garden with loads of fruit on. Ignorant at the time to free fodder, I thought it was just a decorational bush. I realised years later what I had been missing out on. Loads of free quince! AAAGHH!!! Cynthia – A discovery for me too! Annemarie – I’ve never seen quinces on sale before. But then I’ve never lived in London with it’s incredible markets! Brianna – Can well believe it. I didn’t know what they were till this year. That cheese shop sounds wonderful! David – It’s only in the last few years that I’ve kept my eyes open for what’s edible around me. Still being surprised! If I see one more quince recipe, I will scream with delight and frustration! Still waiting here for these lovely fruit to turn up in my markets. I’d love to grow my own, but haven’t the garden space for it. I’ve commandeered my mom’s plot quite a bit last summer and think she will draw the line somewhere. Bravo on your first successful attempt at membrillo, Wendy! Gloria – Good luck with your quince bush! Susan – I’m impressed they sell them in your markets. Over here it’s a choice of grow them or don’t have them! Beautiful membrillo! I love membrillo, first had it in south American, but have never tried to make my own. Thanks for the instructions! Wendy – I LOVE mebrillo and am jealous that you have a quince tree. Good on you for deciding to grow one because there don’t seem to be as many around as there used to be, and it is such a delicious fruit when cooked. In fact, it is my favourite, and I look forward to late Autumn/beginning Winter because of it. There is nothing like having quince sit around in a bowl in the house, too, for it perfumes a room with its tropical fragrance. Your membrillo looks perfect. Shaun – Had I known quince would fragrance a room, I’d have kept one. As it is, they all ended up in the membrillo. Thanks for the tip though! Will most definitely keep it in mind for next year. In a rush to purchase a gourmet treat for a friend’s 60th evening celebration two days ago I chose Quincessential and a beautiful Brie cheese upon the recommendation of the delicatessen’s owner. I had no idea that the combination of the two on crackers would be so utterly delicious! It was a hit of the evening. I would say that the quince was more jam than paste, but so superb. Luckily I can purchase this from our local Provisions of Central Otago. I remember our huge quince tree in the orchard from childhood days and actually hated the jelly my mother made year after year. Strange how tastes change! I will certainly be trying your recipe which I have revisited! Thanks so much. A friend from Mexico says his mother used to prepare quince with red chili powder, lemon juice, salt and a little garlic … has anyone ever tried something like this? Elizabeth – I haven’t but I certainly will this year. Imagine that would be lovely. Going through old entries of yours and found this. It is hugely popular in Argentina and Uruguay, people eat it for dessert all the time. My roommate used to buy it at the supermarket and keep it and a salty white cheese they eat a lot down there in the fridge for snacking on. Membrillo is actually the Spanish name for quince, dulce de membrillo is the paste. 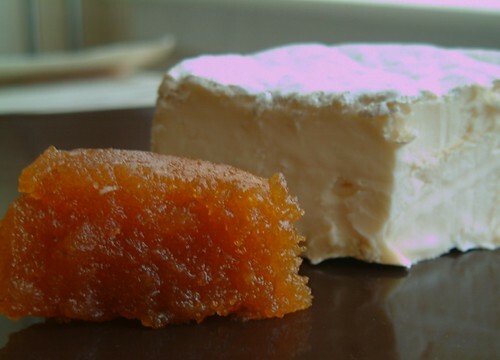 Cheese and membrillo is sometimes called a Martín Fierro after the most famous figure in Argentine literature. I just tried your recipe for the quince paste. In addition i took some suggestions from other food blogs. I found that the water amount was too excessive- maybe just half a cup and let the fruit simmer/steam. I loved how you decided to integrate the skin component of the fruit. It is still setting on my kitchen counter. I began the heating of puree and sugar at about 1.5 on my dial. It was taking quite some time to reach a simmer, so i cranked it up to medium until it reached a boil then reduced it to #3 setting. Still after about an hour my paste was still light in color. This is why i suggest that the water amount be reduced or just used when softening the fruit for pureeing (puree only the fruit and discard the water). In the end, mine came out light in color- i sure hope it isn’t too soft like a jelly. Jose – Thanks for the info. I didn’t make membrillo this year as my quince bush was very unproductive. Will keep this info in mind next year and try less water. Till then I’ve added a note in the recipe to heed your comment. Cheers! I tried to make the paste. Got the consistency but it never turned red. Do I need to cook some more. I’m afraid it will burn. Laura- I was concerned about that too… quite frankly i was tired of getting splattered with napalm, so i gave up after about 1 hour and 30min. Wendy- thank you for your kind reply and taking my suggestion into consideration in your lovely food blog. My quince paste never really set and got firm… but the exterior did after letting it room dry for a while with the center remaining soft like a jam. The sweetness was quite overwhelming for my palette. The flavor of the spices i used though were enjoyable. 6 regular (medium- like a big red apple) quince (i bought them ripe, so ripe that you could eat it raw)- halved, cored, then quartered and diced. I cooked them in 1.5 cups of water (next time i will try 1/4 cup) with the lemon juice and i decided to include the cinnamon stick here. Cooked and let the fruit steam for 5 min. Let cool fruit, then pureed in food processor until fine (i included all the water, but next time i will exclude the water from the puree mixture). Added pureed quince and equal weight of sugar (i found that 3lbs+ of sugar was quite a lot, so next time i will only do about 1/2-3/4 cup of sugar per lb of fruit) to pot and set to medium until it simmered and reduced heat to 3 setting (next time will keep at medium and stir constantly until desired thickness and color is achieved. I got a lot of splattering at this level of heat) let cook for about 1.5 hours maybe more since we did watch Horton Hears a Who throughout the whole cooking. At the last 20 minutes of cooking i added these spices: 1/4-1/2 tsp of Ground Mexican Cinnamon, Ginger, allspice, chile de arbol, cumin and corriander (all fine except for the chile, that grind coarse). In addition i added maybe 1/4 cup of chopped pecans. I haven’t tested my new changes, but will once i get some more membrillos. Laura – I’ve no idea why yours didn’t turn red. Are you in the UK? If not, I think you may be using a different type of quince. Try Jose’s idea about less water? Jose – Think I’ve figured out why I need more water than you. Our UK membrillo are very small and very hard and very bitter. 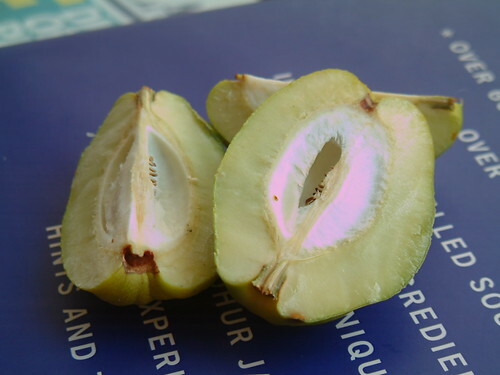 They cannot be eaten raw even if fully ripe. I’m assuming this type have more pectin in them and therefore need more water to get the right consistency. Have you tried or now how you would can the quince paste? hi, having just found your quince recipe & read the comments, i am wondering if the ‘very small’ quince you describe are from one of the ‘chaenomeles’ side of the ‘family’ which are usually grown (and known) as ‘the flowering quince’ in this country, and usually produce small fruit, rather than the ‘cydonia oblonga’ which is the one that grows to small tree size & has the very big fruit. i think this might account for all the differences people are experiencing with the cooking & final results of the recipe. site on each, you will see what i mean. love the recipe – regards, your friendly fruit growing gardener. Is the quince 2 kg after coring so that more than 2kg are needed? Marie – It keeps for such a very long time simply wrapped that I hadn’t considered it. Laraine – Aahhhh… Suspect you may have just solved the mystery. 🙂 Thank you! Margaret – It was 2kg before coring. It won’t matter either way though as the pureed liquid is weighed before the sugar is added. I believe that the Cydonia Oblonga (the tree) is the “Membrillo” that makes the wonderful paste, pie and other treats. The flowering bush (chenomeles) does fruit, but is not nearly as tasty. You should be able to grow the Cydonia in Scotland, as it is fairly cold hardy. Just found this site after Googling, ‘Membrillo’. I bought a jar of Spanish Quince Paste last year and have been unable to buy it locally since then. Delicious! Now I’m wanting to make my own. I have a Chenomeles (previous post) in my garden but it’s rather neglected after years of being grown over by other bushes. Time for some TLC and possibly looking to see if I can plant a ‘Membrillo’. ps. Thank you for the lovely photographs at the beginning of this post! my quince is not turning that characteristic “orange” color. did i do something wrong? I’ve just made my first batch of Membrillo. It’s worked beautifully, although I think I overdid the lemon juice a trifle. I’m looking forward to giving pieces to friends. If you happen to live in the North West of England, Booths (supermarket) are selling Quince. Not sure what variety until I go along to get some. But hurry, I think the season ends soon! did you know it can actually last for years in the fridge, mine is 2 years old and getting even better with age but I did make 10kg, makes great gifts! How do you store your quince paste and what container do you store it in? Mine set on the top but is quite soft underneath so I’m not sure whether to transfer the squares to a plastic ‘Tupperware’ type container or scoop it all up into a Kilner jar?